ONLY A FEW DAYS REMAIN! #1 New Release in Prophecy! or VISIT LADA RAY BOOKSTORE to find all buy links! LADA RAY PAPERBACKS & EBOOKS AVAILABLE ON AMAZON WORLDWIDE, BARNES&NOBLE, APPLE STORE, KOBO/WALMART, INDIEBOUND, GOOGLE PLAY, SCRIBD, and much more! You can ask your local library, book club and bookshop to carry Lada Ray books! We made it easy for you to contact your library or shop, or to share with friends! Click to download, email or print this cool and compact INFO PACKAGE! If you are interested in helping us spread awareness of Lada Ray’s new book and tell people you know, we have a very helpful new feature on Author Site you may want to check out! You can ask your local library or bookshop to carry Lada Ray books! We’ve made it super easy for you to contact libraries, bookshops, share with friends or your favorite book club! SO VERY PLEASED TO PRESENT THE NEW FEATURE! Did you know that you can ask your library ​to carry Lada Ray books? The library can order the ebooks or paperbacks through Amazon, Bibliotheca or Baker&Taylor! You may do the same for your local bookshop, who can order from Amazon, IndieBound, etc. Most of these distribute internationally! To make it easy for you, your friends, libraries and bookshops we have designed a compact, at-a-glance Info Package! ​LIBRARY & BOOKSHOP DISTRIBUTION 4-page INFO PACKAGE! ​It’ll also come handy if you want to email my new book info to your friends, or perhaps, share it with a local book club! WE MADE IT EASY FOR YOU TO SHARE! Download PDF, Print, Email and/or share on Social Media! TIP! To ensure your contacts get interested, it helps if you are excited and enthusiastic about the book! When composing the email, draw inspiration from my description and/or reader reviews, which are part of the package! Or perhaps you are inspired to write your own review? I would love to see it, and so would thousands of potential readers! Please post it on Amazon, BN, Kobo, Apple and/or Goodreads! And let me and my followers know, as well! You can do so by posting your review on FT and/or LRPatreon! I’ll be happy to feature it in Reviews! ​And even better news! My new READ & REVIEW PROGRAM is coming, with special gifts for reviewers & awesome live events for my book readers! in raising awareness of the forward-looking QUANTUM CALIBRATIONS & my new book! IndieBound.org – distribution to independent US book stores, find out where the book is available in your area by clicking on link! All Amazon and other buy links are listed on the BOOKSTORE page! On this page you’ll also find links to where my novels are currently for sale. MY NEW BOOK NOW HAS ITS OWN SUITE ON MY AUTHOR SITE! I’ve added the book’s first reviews (and I intend to add more, as they appear!). I also added a VERY extensive excerpt! If you haven’t read the book yet, check it out! Print, Email or Share via your social media! You can send this COMPLETE BOOK INFO PACKAGE to your library, fave bookshop, a friend or local book club! Read about MY NEW SHARE THE BOOK PROGRAM! GO HERE to download INFO PACKAGE PDF or get Email Link! On Amazon worldwide, Barnes&Noble, Kobo, Apple, IndieBound, Scribd, etc. New revolutionary tool for in-depth understanding of our world, from the creator of FuturisTrendcast, Earth Shift System and Quantum Calibrations! Nearly 1000 unique Calibrations, peer group comparisons, analysis and acclaimed Lada Ray Predictions! Encompassing: 94 countries & territories; 10 global organizations; 7 leading business/corporate worlds; leaders, armies, economies, finances, solvency and sovereignty! Plus: one-of-a-kind index of the world’s most powerful people, and created especially for this book new Power Scale: 4 superpowers, 11 great & regional powers! ~A fascinating planetary tour by the hand of a special guide…countries, their leaders and people, secrets behind façades, and potentials to come. Quite an experience! Success! Nancy Chester: What I see as invaluable is the connection of an individual sovereign human being contributing to the calibrations, along with people in other cities, countries, regions and cultures. It’s an awesome thought to realize just how much power we really have to shape the world around us. George: Lada’s QC and GC provide detailed and unambiguous insights into our past, present and future at the personal, society, world and cosmic levels. Coupled with Lada’s wise counsel, I have found them to be invaluable tools in making better decisions about relationships, parenting, career, finances and even purchasing a house! Paul Eric: The Quantum and Geo Calibrations show with a lot of clarity what is really going on in the world – behind the facade of public declarations and media propaganda. It is especially helpful to understand the approximate timeline of the Earth Shift as it relates to different parts of the world, eg. the Inverted Collapse of the US. This can help with personal decisions as well, such as where you choose to live or which long-term careers or investments you pursue. Lada has been spot-on in her predictions of future events, including the election of Donald Trump, as well as his subsequent inability to change anything significant! NadiaH: To me, the value of Quantum and Geo Calibrations is the at-a-glance understanding of where a person, country, event, etc., is. For me it provides an independent truth. 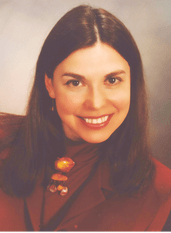 To date, Lada authored over two thousand articles, podcasts, Earth Shift Reports and Webinars. Born in Russia, she is Multidimensional Futurist and Geopolitical Author, currently residing in the West. She is acclaimed for her uncanny predictions, unique analysis and global forecasts. Her Futurist Trendcast blog since 2014 has been visited by 1.2 million readers. Lada also is the author of three novels and two novelette shorts. ​What makes this book stand out is Lada Ray’s trademark fusion of geopolitical analysis, economics, predictions and higher-consciousness knowledge. Some may believe these things separate and non-combine-able. However, as proven by Lada’s work, both practical and spiritual us are ONE. In our era it becomes paramount to understand our world in its totality, to heal past karma and to move forward. Helping humanity accomplish both is the reason for this book. Written in clear, concise, easy to understand manner, it is a seamless blend of practical knowledge and reason, compassionate heart and prophetic predictions. This seamless multidimensional blend is the basis for creation and it is THE FUTURE! Reading this book will help you get there! Lada Ray’s New Quantum Calibration System is based on the ground-breaking Calibrations of Human Consciousness introduced by David Hawkins, Ph.D., in his book, Power vs. Force. Between 2002-2018 Lada developed her own advanced Quantum and Geo Calibrations. This breakthrough system goes well beyond the original, introducing a more targeted, refined and high-consciousness result. The system has for years been successfully applied in her writings, webinars and private consultations, with vast majority of Lada Ray’s clients remaining her return clients for life. Years of development and application confirm that Quantum and Geo Calibration System is the most efficient, all-encompassing and profound tool for revealing the fundamental energetic, structural and spiritual truth about our world, currently in existence. The truths that have been hidden will come to light. Where there previously was confusion and chaos, the realization, clarity and structure will emerge. A new, deeper and higher understanding will take place, allowing us to see forward and to act in the best and most beneficial way. The smart politicians, economists, companies and governments can apply Quantum Calibrations productively on global, regional and local levels. Individuals can use this book to compare countries, leaders, economies, armies, and to make decisions on relocation. The book has promising practical and academic applications for researchers, scholars and ordinary citizens alike. Use it to project into the future and plan your next steps on the journey through our fast-shifting world. The GREAT EARTH SHIFT is manifesting in all areas of life, from nature and environment to social, geopolitical, financial and economic changes. Our mentality and consciousness are changing rapidly. If you have been confused, scared or curious of all the changes, Lada Ray theories and practices will help you acquire the much needed clarity, understanding and peace of mind. Something very important happened yesterday! for Russia, China, Iran & US? The government of Kazakhstan was dismissed, also suddenly, 3 weeks ago. The long-stranding leader of Kazakhstan has been replaced with the new face, a pro-West, as he is being characterized by some, speaker of the Kazakh parliament. Therefore, the outside pressure is definitely a factor. Listen to the podcast to hear my assessment of him, along with my urgent overview/assessment and predictions on what’s happening in and around Kazakhstan, including the strategically important Caspian. This is a huge development! US is trying to make Kazakhstan agree to a US base on Caspian, following a series of blackmails, as described in my new book! And note that all this is happening right on the dot, just as Russia celebrates the 5th anniversary of the Crimean people’s referendum and Russia’s reunification with Crimea! Coincidence?.. Or a skillful outside pressure on Kazakhstan with the purpose of sending a MESSAGE and executing REVENGE against Russia for ‘daring’ to take over Crimea?.. Will Russia and Iran allow the US base on Caspian? Listen to my prediction in EarthShiftPodcast9! Please check it out, LIKE, SHARE and comment! Please subscribe to LADA RAY YT CHANNEL so not to miss future ESPs! And we plan lots of them, going forward! Moreover, they’ll get more and more interesting! Stay tuned for announcements of the new ESPs soon! Kazakhstan has its own extensive chapter in the new book! READ AND REVIEW LADA RAY’S NEW BOOK! Ebook only $9.99! Thank you for all your reviews! Looking forward to more soon! Start reading Geopolitical & Geo-Economic Quantum Calibrations on your Kindle in under a minute. PAPERBACK NOW AVAILABLE ON AMAZON! NEW RELEASE: Geopolitical & Geo-Economic Quantum Calibrations! PAPERBACK IS NOW AVAILABLE ON AMAZON! WOW! My New EBook Already #1 NEW RELEASE in ‘Prophecy’ on Amazon! Wow! I just announced the book several hours ago and this is the result already! Amazon screen snapshot, 11 am, 2/25/19, the day of the official release! PAPERBACK COMING BETWEEN some time later on MONDAY – WEDNESDAY (it depends on when Amazon releases it!). I’ll announce and post links as soon as this happens! PLEASE CONSIDER WRITING A REVIEW! I’LL REALLY APPRECIATE IT AND IT’LL HELP AMAZON READERS, WHO’VE NEVER HEARD OF ME AND MY WORK, DECIDE TO BUY THE BOOK! GREAT NEWS! Geopolitical & Geo-Economic Quantum Calibrations Book Now Available on Amazon! BOOK BUY LINKS, STATS & PRICING! GEOPOLITICAL & GEO-ECONOMIC QUANTUM CALIBRATIONS: Official Book Launch, Amazon Release Status, Final Cover & Official Description! MY NEW EBOOK NOW AVAILABLE ON AMAZON! Ebook is for sale in all international Amazon markets! READ BOOK DESCRIPTION, TAKE A PEEK INSIDE, FLIP THROUGH PAGES & BUY! PAPERBACK WILL BE AVAILABLE FEB 25-27, MONDAY-WEDNESDAY! It’ll be sold by Amazon in the US, UK, Germany, France, Spain, Italy and Japan. Readers who reside in these or neighboring countries can purchase from related markets. For example, the residents of most European countries can purchase this book from the UK, Germany, France, Spain or Italy! This book is a labor of love and it contains close to 1000 calibrations for 91 countries and territories, 10 international organizations, events, superpowers and great powers, and more! Plus, extensive geopolitical and geo-economic analysis, Earth Shift predictions, forecasts and multidimensional revelations. For a limited time Paperback is priced at only $18.99 US! Please consider leaving a review after reading the book! I’ll be very grateful! Verified purchase buyer reviews are very important so that more people can learn about the book! The more reviews the better Amazon will promote it, therefore more people will see it. The best place to leave reviews is Amazon.com, but other countries’ sites where the book is sold are fine, too! I’ll have more on reviews soon! Paperback link will be added to this page in several days! This book is enrolled in Matchbook program! Stay tuned, I’ll explain what this means when paperback is out! WELCOME TO THE OFFICIAL NEW BOOK LAUNCH! a new book by Lada Ray! PUBLICATION & AMAZON RELEASE STATUS! The book has been finished as both ebook and paperback, and submitted to Amazon worldwide! Amazon has informed me that it’ll take them another 2-3 days to review it and make it available for sale (sorry for the delay, I am just as anxious and fired up as you are to finally see it on Amazon and everywhere else)! Therefore, the book, provided everything is well, will go live and be listed for sale on Amazon by next Monday-Wednesday. It will be available for purchase worldwide on all 13 Amazon sites, including US, UK, Canada, Australia, a number of European countries, including Germany, France, Netherlands, Italy, Spain and more, plus India, Brazil and Japan. The ebook can be purchased for an instant download to your computer, kindle or ebook reader, or it can be purchased as physical paperback. Paperback may take a few days longer to be available. Amazon ships paperbacks to most worldwide locations! I will announce and post links to where my book is listed on Amazon as soon as they are available! The book will also be available for purchase on a number of other sites, such as BN, Smashwords and Apple store. I’ll let you know what those are as soon as they are available! READ THE BOOK’S OFFICIAL AMAZON DESCRIPTION! New revolutionary tool for in-depth understanding of our world, from the creator of FuturisTrendcast, Earth Shift System and Quantum Calibrations! 4 superpowers, 11 great & regional powers! 7 leading business/ corporate worlds! Plus the countries’ leaders, armies, economies, finances, solvency and sovereignty! World’s most powerful people & more! 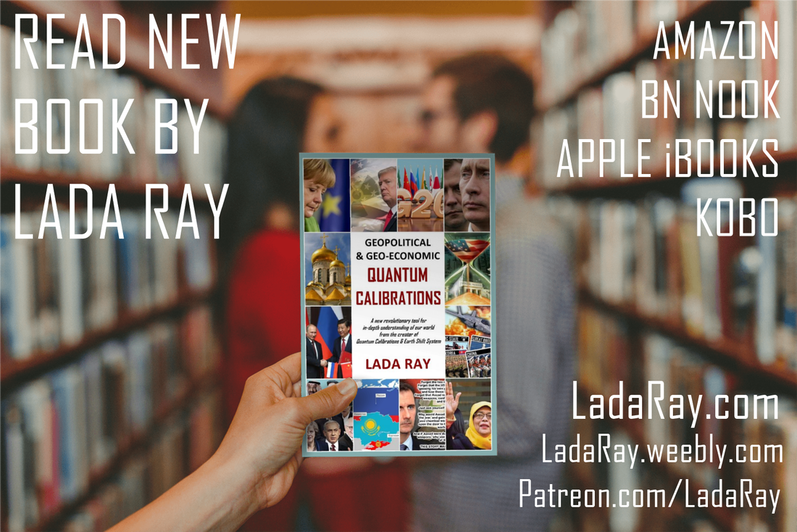 What makes this book stand out is Lada Ray’s trademark blend of geopolitical analysis, economics, statistics, predictions and higher-consciousness knowledge. Some may believe these things separate and non-combine-able. However, as proven by Lada’s work, the compartmentalized mentality practiced by mankind today is the result of the fractured 3D consciousness, when one side of our nature fights with another, when yin and yang are in conflict. As a result of compartmentalization those who feel comfortable in the ‘real’ world don’t understand or deny the unseen and higher-dimensional, while those who consider themselves spiritual shy away from the real world. In reality, both practical and spiritual us are ONE. It pays to understand our world in its totality, to heal past karma and to move forward. Helping humanity to accomplish both is the reason for this book! A seamless blend of practical knowledge, cold reason, warm, compassionate heart and higher-consciousness spirituality is THE FUTURE! This book will help you get there! 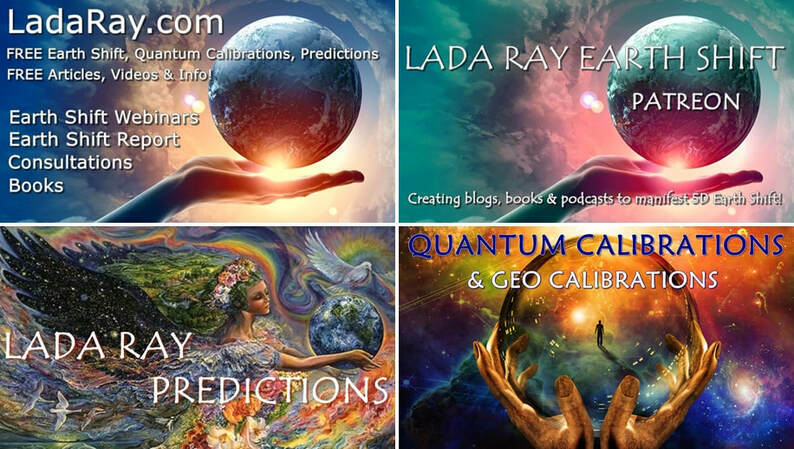 Lada Ray’s New Quantum and Geo Calibration System is based on the ground-breaking Calibrations of Human Consciousness introduced by David Hawkins, M.D., Ph.D. in his book, Power vs. Force. Between 2002-2018 Lada developed her own advanced system of Quantum and Geo Calibrations. This breakthrough system goes well beyond the original, introducing a more targeted, refined and high-consciousness result. Lada Ray’s system has for years been successfully applied in her writings, Webinars and Private Consultations, with vast majority of Lada’s clients remaining her return clients for life. After years of development and application, it can be confidently said that Quantum and Geo Calibration System is the most efficient, all-encompassing and profound tool for revealing the fundamental energetic, structural and spiritual truth about any event, subject or object in our world, currently in existence. The truths that have been hidden will come to light. Where there previously was confusion and chaos, the realization, clarity and structure will emerge. A new, deeper and higher understanding will take place, allowing us to see forward and to act in the best and most beneficial way. The smart politicians, economists, companies and governments can apply Quantum Calibrations productively on global, regional and local levels to analyze and troubleshoot problems in their respective subjects. Individuals can use this book to compare countries, leaders, economies, armies, etc., and to make decisions on relocation. The book has promising academic applications for researchers, scholars and ordinary citizens alike. Use this book to project into the future and plan your next steps on the journey through our fast-shifting world. The GREAT EARTH SHIFT is manifesting in all areas of our life, from nature and environment to social, geopolitical, financial and economic changes. Our mentality and our consciousness are changing rapidly. Through the new technological revolution we are transitioning to a new society and new dimension of being, in Lada’s classification: the lower-4D. Thank you for being here, thank you for reading, and I hope you’ll continue learning! NEW BOOK PRE-RELEASE! GEOPOLITICAL & GEO-ECONOMIC QUANTUM CALIBRATIONS: COMPLETE TABLE OF CONTENTS! NEW BOOK – FINAL STRETCH! INSIDE PEAK: INFO & STATS! Nigeria vs. South Africa: Extended Comparative Double! Africa’s Past, Present and Future Case Study, 4 Epic Sets of Calibrations + Earth-Shifting Interpretations! w. Triple Bonus: My Calibration Secrets, the Problem With Western Democracy & Predictions! With My Forbidden History & Calibration Secrets, including Lemuria! With bonus calibrations of BREXIT and London! Compare US, UK, Denmark, Germany, China, India & Russia! LADA RAY PATREON OPEN HOUSE IS EXTENDED TO FEBRUARY! PLEASE STAY TUNED FOR THE NEW BOOK COUNT-DOWN OPEN HOUSE! Check out NEW BOOK COUNT-DOWN OPEN HOUSE ON LADA RAY PATREON IN FEBRUARY! FREE insights and articles! NEW FREE POST ON LADA RAY PATREON! Urgent! Brazil to Exit BRICS? URGENT! Current Calibrations & Predictions for Venezuela! Any hope for Venezuela to avoid becoming the next Syria? HEADS UP! COMING ON PATREON THIS WEEK! Please stay tuned for the following articles! Oil & Ultimatums: What are US, Russia & China Trying to Achieve in Venezuela? Whole Truth! Also coming! Exclusively on LADA RAY PATREON! The latest variant of the Abrams tank, USA, is currently the M1A2 SEP. Building one from scratch is reported to cost 8.58 million USD. If you already have an M1A1/A2 available, then the SEP upgrade will only cost you 6.81 million USD. ONLY! LOL. New Russian tank Armata: costs seem to vary between discounted preview price of under $4mln to $7-8mln, according to some Western ‘experts,’ but then we know how believable and ‘Russia-friendly’ those are. Average tank from various world manufacturers costs anywhere between $3.5mln and $8+mln. The upper end can be as high as $12+mln. The cost efficiency to quality ratio seems to be by far the highest in Russian and Israeli tanks. Heavy US M1 Abrams, a whooping 68 tons in weight – per the video below, tends to get stuck in the mud due to being seriously overweight, lol. Who needs that maneuverability, right? As long as the military-industrial complex gets to make more money! Merkava (Merkava mk.4) – $3.5 million to IDF; $4.5 million to others. LADA RAY PREDICTIONS! Will US Plan to Weaken Russian Orthodox Church Succeed? Largest since 1991 NATO drills in Norway – What do Russians Think? Russian MoD CONFIRMS: S-300s Already in Operation in #Syria, SAA Troops in Accelerated Training! How funny! The news of Russia supplying S-300s to Syrian army stopped cold turkey the bombings and threats to bomb Syria by Israel, US and their cronies. Russia tried very hard to work with Western ‘partners,’ as Putin calls them, only to see backstabbing in return. US/Israel tried to find out how to outsmart S-300s, through Kiev’s new betrayal of Russia, by buying old Soviet S-300s from Ukraine. Kiev eagerly assisted by welcoming Israel/US pilots and jets to test how S-300s work in Ukraine. All this trouble, only to find out that those are NOT at all the same S-300s Syria is getting today. The secret is in electronics and control systems, where the new Russian designs are light years ahead. The training of Syrian army specialists in accelerated. For the time being, the S-300s in operation already are manned by Iranian specialists, under Russian army instructors’ supervision. О как мило! Глава МИДа Британии Джереми Хант сказал, что ну-ооооочень озабочен заявлением Эрдогана, что убийство журналиста было запланировано саудитами. Мы по прежнему ждём ответов – сказал он. “Россия заплатит высокую цену за убийство Скрипаля” – сказал он месяцем раньше. FYI: MBS is Saudi crown prince. Confirming all the above, Trump said that sanctions vs Saudi Arabia will result in skyrocketing oil prices and will hurt US economy. Maybe true, but where were these ‘sound’ economic considerations when the diabolical sanctions against Russia were adopted, and then adopted again, and again? EU economy suffered plenty of hardship, and will suffer more due to Iran sanctions. But who cares about Europe. Just confirms how subservient the EU is to Anglo-Americans. Also confirms how desperate they are becoming due to #EarthShift, and how desperately they are trying to squash Russia the Great Balancer! to hear news and be a part of these timely conversations!